What does it mean to lead a moral life? In her first extended study of moral philosophy, Judith Butler offers a provocative outline for a new ethical practice-one responsive to the need for critical autonomy and grounded in a new sense of the human subject. Butler takes as her starting point one's ability to answer the questions "What have I done?" and "What ought I to do?" She shows that these question can be answered only by asking a prior question, "Who is this `I' who is under an obligation to give an account of itself and to act in certain ways?" Because I find that I cannot give an account of myself without accounting for the social conditions under which I emerge, ethical reflection requires a turn to social theory. In three powerfully crafted and lucidly written chapters, Butler demonstrates how difficult it is to give an account of oneself, and how this lack of self-transparency and narratibility is crucial to an ethical understanding of the human. In brilliant dialogue with Adorno, Levinas, Foucault, and other thinkers, she eloquently argues the limits, possibilities, and dangers of contemporary ethical thought. Butler offers a critique of the moral self, arguing that the transparent, rational, and continuous ethical subject is an impossible construct that seeks to deny the specificity of what it is to be human. We can know ourselves only incompletely, and only in relation to a broader social world that has always preceded us and already shaped us in ways we cannot grasp. If inevitably we are partially opaque to ourselves, how can giving an account of ourselves define the ethical act? And doesn't an ethical system that holds us impossibly accountable for full self-knowledge and self-consistency inflict a kind of psychic violence, leading to a culture of self-beratement and cruelty? How does the turn to social theory offer us a chance to understand the specifically social character of our own unknowingness about ourselves? 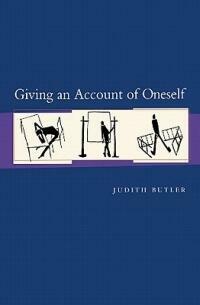 In this invaluable book, by recasting ethics as a project in which being ethical means becoming critical of norms under which we are asked to act, but which we can never fully choose, Butler illuminates what it means for us as "fallible creatures" to create and share an ethics of vulnerability, humility, and ethical responsiveness.